Owners of Samsung’s 2016 smartphones in the United States have anxiously been waiting for their carriers to release the Nougat update that Samsung started rolling out for the international unlocked variant of the Galaxy S7 and the Galaxy S7 edge in the second week of January. T-Mobile started pushing out the update earlier this week, and the wait ends today for AT&T subscribers. The second largest carrier in the United States has finally released Android 7.0 Nougat for the Galaxy S7 and the Galaxy S7 edge. 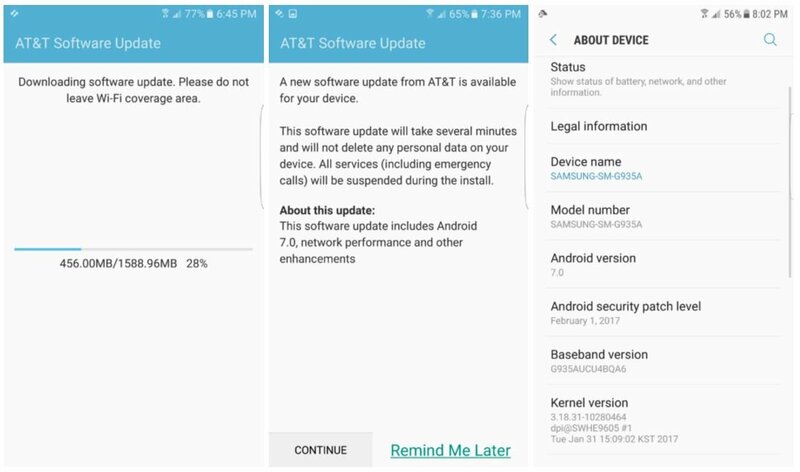 AT&T’s support pages for the two devices hasn’t been updated with information on the Nougat update, but it is rolling out over the air for many users and should soon be available to every Galaxy S7 and S7 edge owner on the carrier’s network. Nougat brings more than a few changes for the devices, including but not limited to user interface tweaks, several new features and overall system and performance enhancements. If you’re curious to find out more, don’t forget to check out our What’s New With Nougat series and also see a few tips and tricks to get the most out of your device and the latest iteration of the OS. i think this is some strange test by samsung. Any Nougat info on the S7 Active? Anyone with Three UK S7/S7 Edge phones!!! The nougat has finally been released. It’s 1308.58MB and now supports native wifi calling. AT&T Mexico when it updates its Galaxy S7 edge SM-G935F??? I think i move to uranus and buy a branded G935F from Mars Television instead of my DBT version, so i might get the Nougat update this year. Am using S7 SM-G930T1 metro pcs. when will i get the Nougat update for my device? I am on AT&T phone unlocked now using T-Mobile sim. I still haven’t received an update yet. You need a at&t sim or connect to a at&t wifi, otherwise you won’t get the update . Para cuándo Nougat para el S7 modelo TTT? This crazy people just vote down the comments . How about Hongkong SM-G9350?…I am waiting nougat for 2 months ago. I’m still waiting for the update on my unlocked s7 edge international variant, running the beta version of Android Nougat 7.0. Any ideas When it’s happening? Democratic People’s Republic of Korea? When will it come to KSA unlocked version SM-G935F. Anyone pls help me My uncle bought an unlocked at&t s7 edge.Whenever I click software update,it checks for sometime and says current software is up to date ,check again in 24 hours.If I try before 24 hours nothing happens.But the security patch is of April.And after 24 hours,the same thing happens and says Check again in 24 hours.Any solution? Guys when will i have this update for A5 2017?